Hi guys, I started a new project since I wanted to put all my shrimps in a place just for them. This project is very simple, and cheap. I've enjoyed it so much and when I finished I liked it and most important, the next day, and the other I still like it. Not like my community which I keep changing things because I feel it's not complete. Since we don't use the hearth I wanted to put the tank there. The hearth has a stair which leaves the place pretty useless so I went to Ikea and found this TV bench which looked strong enough for 2 nanos of 30l. I had a layout in mind,a goldfish layout I watched in youtube, I also did a drawn based in that layout but with a touch of green. In the end I haven't used that layout. 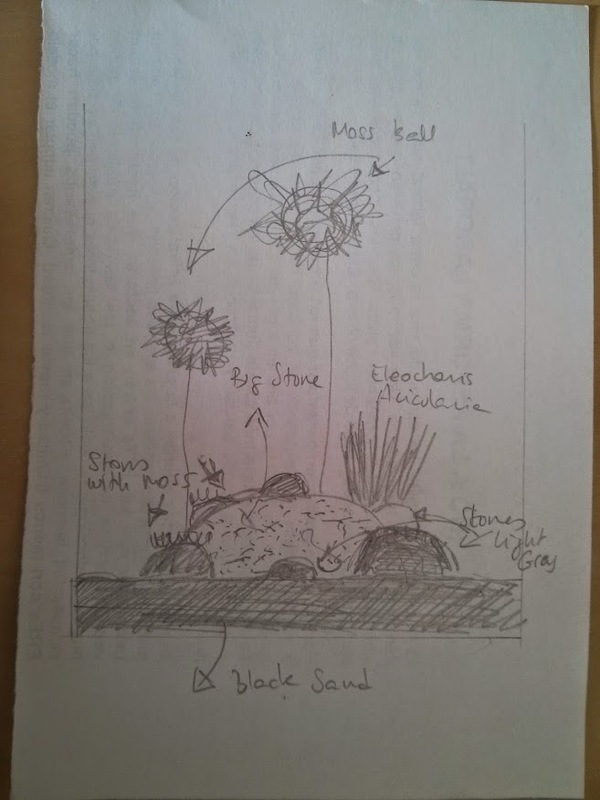 But I wanted something with few plants, but not too many because I could not enjoy my shrimps, stones, black sand and a red moor root with a tree form. Basically I had in mind a mini japanese garden. 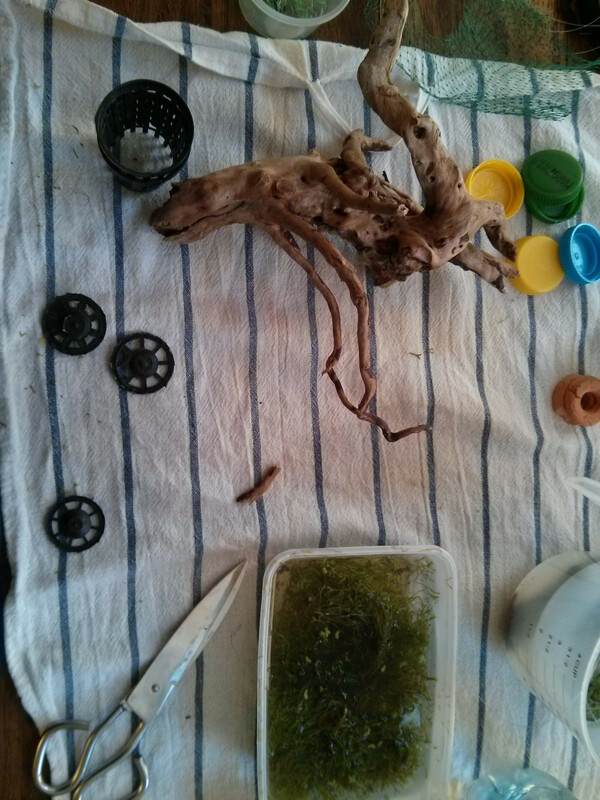 - The bottom of the plastic pots where aquatic plants come. At first I put the sand and then started to place the stones, some of them were pretty huge so I added a polystyrene sheet under them but I realised the sand wasn't enough to cover everything because I bought it thinking in a plain coat. Since the sand was bought in seahorse and I could not go there until one or two weeks later I went to a close lfs and bought black gravel and other stuff for my community (which was a BIG mistake). I put the polystyrene, the gravel, part of the sand and some stones. Then I started with the tree. Here is when I used the bottoms of the plastic pots covered with riccia and with the green net and tied them like candy. 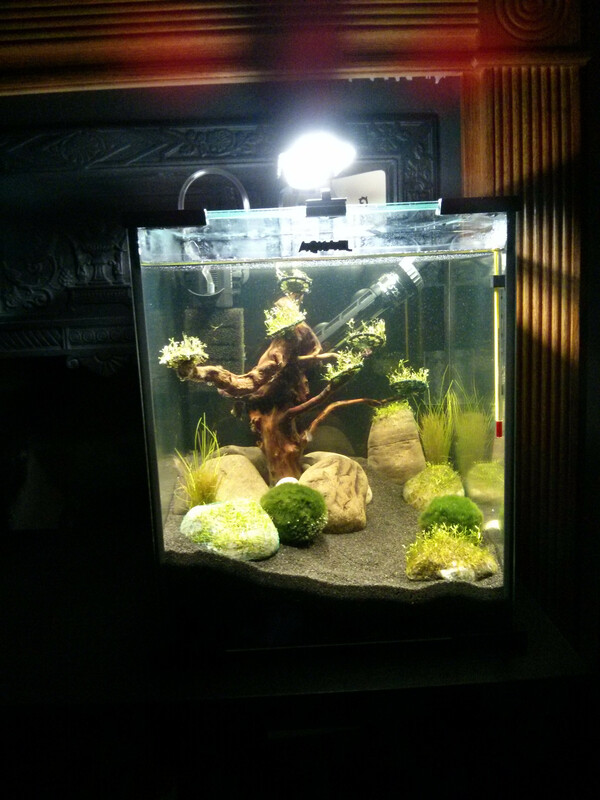 Tied the riccia candy to several parts of the tree and placed it in the nano. 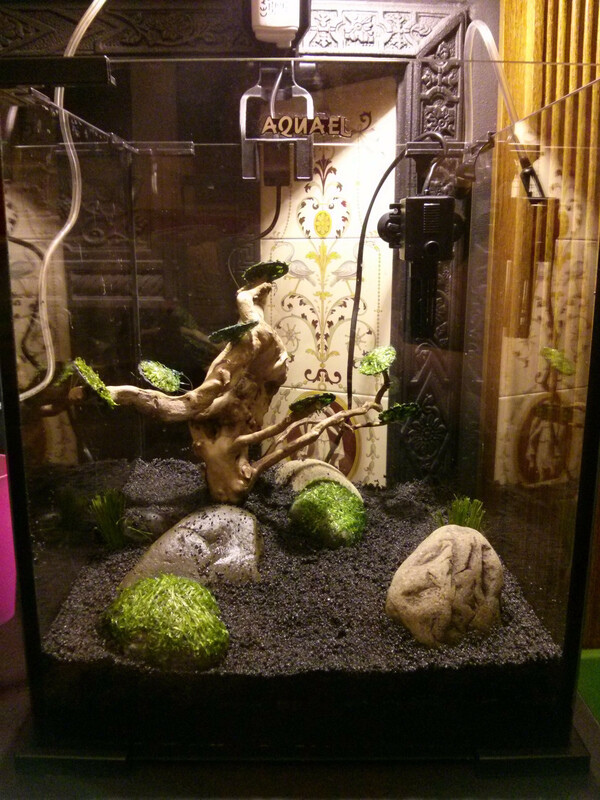 Put some plants too and riccia attached to some small stones. Added more sand and more stones. And filled it. Two weeks later I added some amanos and a spickey nerite, who took rid of the brown algae. 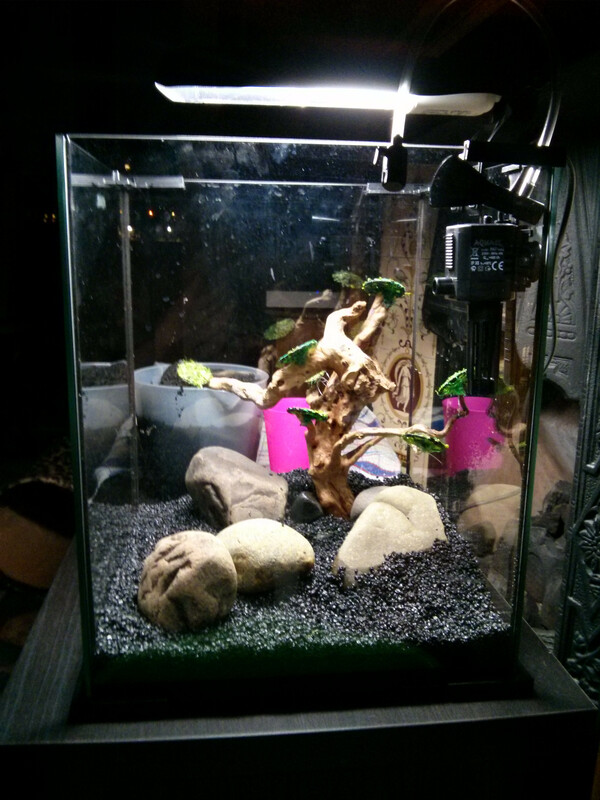 Yesterday I moved most of my shrimps into it. After three weeks this is how it looks. I watch this tank from my computer desk and from the sofa so I wanted it to be nice by two points of view. 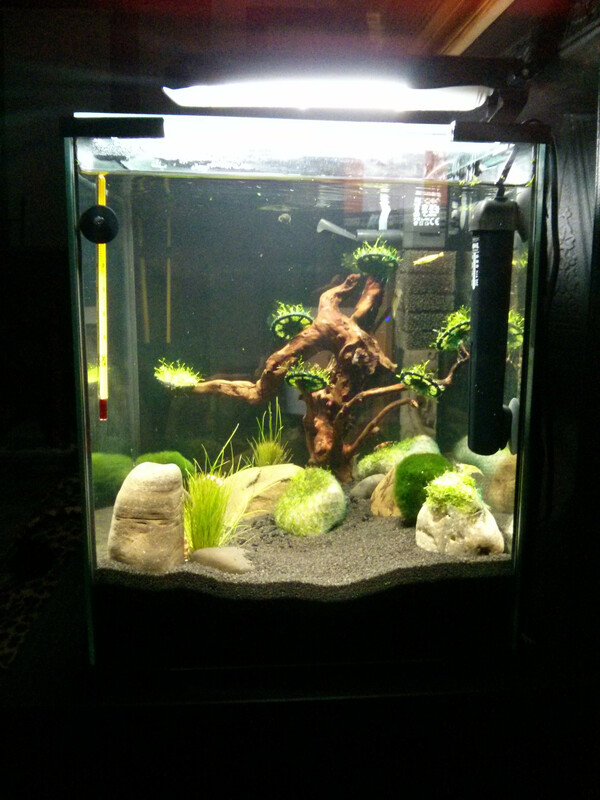 As with my community tank I'm dossing it with easy carbo and profito. This last photos are not very good, I will replace them. Thanks to LemonJelly for giving me some stones. Last edit: 05 Jun 2014 10:21 by Aroshni (Lydia Olivera). Last edit: 01 Apr 2014 21:14 by Lauris (Lauris). Thanks guys. 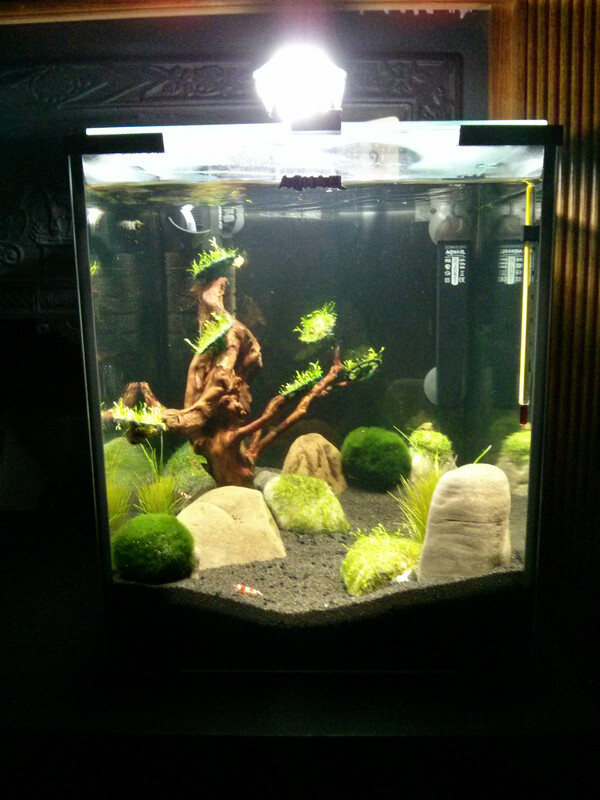 The plants are doing well, eleocharis started to expand with no substrate although I didn't want to. I'm having right now some planaria and ammonia peaks so I moved my shrimps back to the community tank until everything is settled. Im still thinking about getting one too . 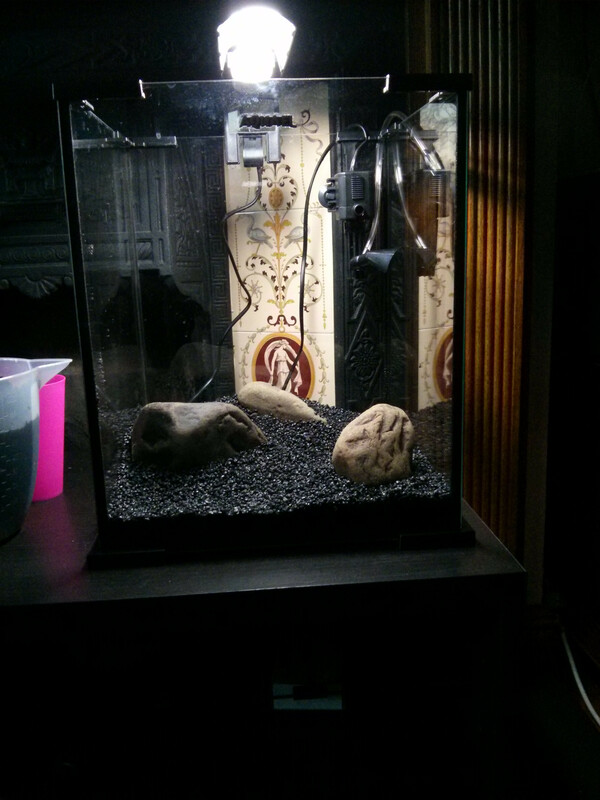 Wanted to get rid of the planaria without using any products so I dismantled the tank and started it again, but this time I bought more sand from seahorse and removed the gravel. Change it a bit but basically is the same idea. Also bought another heater with temperature selector, the preset one was driving me crazy. Last edit: 12 Apr 2014 20:42 by Aroshni (Lydia Olivera). Homer wrote: ella es un genio!! Tank looks great fair play. Last edit: 16 Apr 2014 20:45 by blade (Michael G). Thanks guys I'm glad you like it! Kev gracias amigo! Blade if I have any prob with them incomposition l'll use this method for sure. Found info about it from different sources but don't know where to get the fenbendaloze. Yesterday I bought deworming tablets for my dog and cats but it doesn't mention chemical composition, just drontal. Where did you bought them? Since I got crs shrimplets this week and I'm watching them always in the moss I'm most likely to replace the riccia on the tree with java moss, but keeping it on the plastic dishes. Aroshni wrote: Blade if I have any prob with them incomposition l'll use this method for sure. Found info about it from different sources but don't know where to get the fenbendaloze. Yesterday I bought deworming tablets for my dog and cats but it doesn't mention chemical composition, just drontal. Where did you bought them?. Hey Lydia where did you get the light for your nano tank? Does seahorse stock the bulbs? 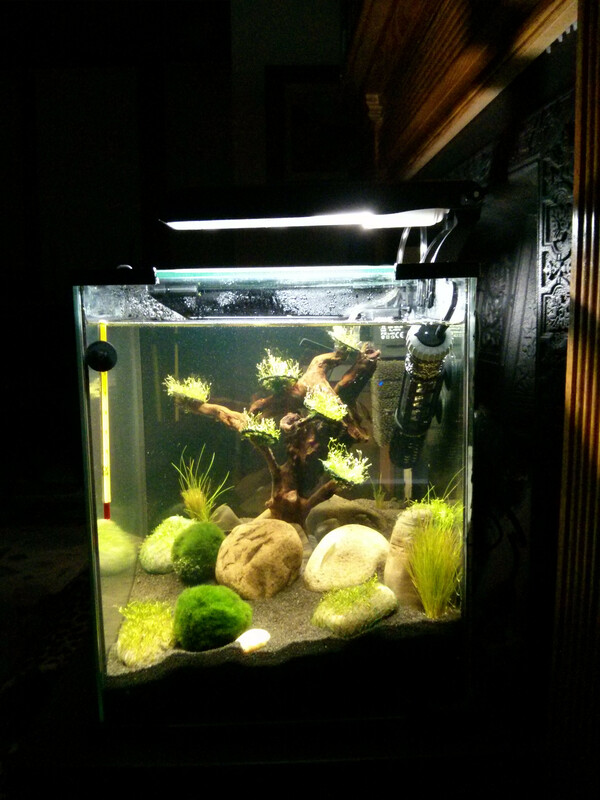 Joekinsella wrote: Hey Lydia where did you get the light for your nano tank? Does seahorse stock the bulbs? Got them with the aquael nano, I guess if seahorse sells aquael products it shouldn't be difficult to get them for you.